How do you put a game like that into words? I’m at a loss. It was easily the biggest hockey game I have ever watched and that is a major understatement. Everything was on the line. The Olympics being held in Vancouver put such enormous pressure on everyone. Olympic Gold wasn’t just on the line, but our national identity as well. I’m not exaggerating. Canadians love hockey more than anything else. Is there another nation that loves anything as much as Canadians love hockey? Hockey is so intrinsically tied to our national identity. Paul Henderson’s goal in the ’72 Summit Series is probably a top-5 moment for Canada as a nation. I’m serious. It matters that much to us. So, being challenged so fiercely in our own game, in our own country, that certainly felt like an attack on our identity. Failure was not an option. This was the most stressful sporting event I have ever witnessed. They couldn’t lose. I don’t know how I would react. The nation would be in a daze. Our collective spirits shattered. I had such a nervous energy this whole morning. My friends and I went to the local bar early to ensure we had good seats, but that was almost worse than waiting around at home. Waiting for the game to start was excruciating. Watching the game was almost torture. Every American rush down the ice was frightening. Jonathan Toews’ opening goal was the biggest relief. There was such a stress coursing through my body and that goal helped calm me down. It was certainly a huge relief for the Canadian team. It made Miller seem beatable. They didn’t have to play with the added pressure of rallying from behind under the collective tension of 17,000 + fans. There was certainly a lot to be tense about because this was an absolutely fantastic hockey game. Both teams played as hard as they could and raced up and down the ice hitting with a ferocity normally reserved for the NHL playoffs. They traded chances and both goaltenders lived up to their billing as two of the game’s best netminders. Two of Canada’s most criticised players, Pronger and Niedermayer, played their best games of the tournament and played at a level I didn’t think either was still capable of playing. It was clear they weren’t just there for their leadership experience. What’s even more impressive, considering that both teams were extremely young, was that neither team showed signs of nervousness. Both teams passed the puck well and looked mature beyond their years. Before the game’s dying seconds I had a strong feeling that the U.S. was going to tie the game. I tried to block it out, but they were spending most the third period in the Canadian zone and it seemed inevitable that the game was going to overtime. When they did score there was a crushing feeling that captured everyone. We were so close to winning gold. The fact that Zach Parise scored was not surprising. He was America’s most dangerous forward the entire tournament and certainly proved to everyone that he is indeed one of the game’s premier players. What’s amazing about that tying goal was the reaction from everyone in the bar. We were certainly shocked. We were certainly angry. But nobody felt any defeat. After Slovakia scored the first goal to make it 3-1 in the semi-finals there was a real fear that they were coming back to tie the game. The tension was incredible. But after America tied the game there wasn’t any fear that Canada would lose. Maybe it crossed our minds. But the feeling was that Canada was going to win this game. We had to. We would. The start of the overtime period was met with a raucous ‘Go Canada Go’ chant that rang through the bar. I can’t say enough about watching the game at a bar among a bunch of strangers in the middle of the afternoon. Everyone cheered for each Canadian shot and rained down a chorus of “Luuuuuuus”, no matter how easy the save by Luongo. After every Canadian goal the place erupted. To say there was elation after Sidney Crosby’s overtime winner isn’t doing it justice. Someone even bought shots for the whole bar. Canada! I can’t even imagine the atmosphere in Vancouver. Can tomorrow be considered a national holiday? It was fitting that Sidney Crosby scored the game winner. Not only is he the new poster child for Canadian hockey, and next in line to the Gretzky-Lemieux lineage, but he just worked so hard all tournament. He had only scored once in the previous three games (against Germany), but was a physical presence in each game and pursued the puck with a vengeful determination not seen since Liam Neeson in Taken. While Sidney didn’t need to be the golden boy throughout the tournament, since Canada had the ability to roll four number 1 lines, this was certainly his team. Scoring the winning goal in overtime was just perfect. It was an amazing win for Canada. The United States also impressed me tremendously. This was a young team that wasn’t expected to even medal, let alone push the Canadians to the limit in the gold medal game. 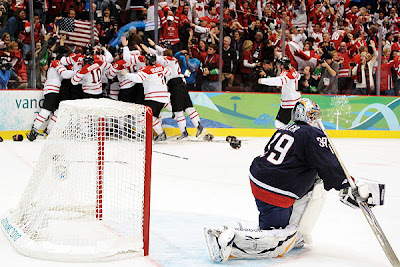 The most impressive player was clearly Ryan Miller, who did everything he could to bring the gold home for America. He only let up more than 2 goals twice and both times were to Canada. As far as forwards go, Zach Parise was obviously great, but Ryan Kesler was one of the best forwards the entire tournament. He played the villain role to perfection by talking some trash, giving a few shots after the whistle, mucking it up in front of the net, but, most importantly, scoring timely goals and playing some great two-way hockey. This is an American team that should now be considered one of the elite teams in international hockey. Sweden, Finland, and Slovakia are all growing older, and the America roster is young and dynamic. Their players are on the cusp of becoming superstars. There are also even younger players not selected for this team, such as James Van Riemsdyk, who look poised to become great players themselves. For team Canada, each player has a free pass from me for the rest of their careers. I’m mainly talking about Joe Thronton and Patrick Marleau since I’ve endlessly criticised them, but the same pass is for everyone. Each member of this team filled their roles capably and were integral parts to Canada’s gold medal. Did I mention that this medal beat the record for most winter Olympic golds? No big deal. Canada doesn’t mess around with any of those silvers or bronzes. Gold or nothing, baby. Pretty much every player on team Canada has earned my unwavering respect for the rest of their careers. I’m particularly enamoured with Jonathan Toews, Drew Doughty, Ryan Getzlaf, Corey Perry, and Brendan Morrow at the moment. Well, that ends the 2010 Olympics. It was a lot of fun. I didn’t think I would enjoy this nearly as much as I did. This could definitely go down as one of those "Where were you when" moments. What an amazing game. The Americans gave all they could but the bottom-line was that Canada, despite all of the distractions about chemistry and hype, had the best team, and proved it when it counted. I am head to toe red and white today here at work, with Canada banners on my door - so proud!! I recall your article on the Sidney Crosby Defense a few weeks ago, and myself stating that my fandom rested on these Olympics... well I think Sid the Kid proved that he is an elite talent in this league and can make those moments that cement a legacy. From that shoot-out goal to prevent embarrassment to the Swiss, to the sudden-death winner... Sid is a gamer. And for all the much deserved hype of Ovechkin, you just have to look at the playoff series last year (Crosby won) and these Olympics, to see how Sid compares, and I'd say it's a pretty close call. As hard as it is for Americans to understand why we love hockey so much, I find it even harder to understand why they don't. It boggles my mind. In related news, 26.5 million Canadians tuned in to watch at least part of the gold medal game. That's 80% of the country! In what other country can something capture the attention of 80% of the population? This goal will certainly be this generation's '72, although I don't think it can match it just because of the intense cultural aspect of the Summit Series. '72 was about much more than hockey. Either way, Sid's goal was huge and capped off a fantastic Olympics for Candada. Miracle on Ice: Part II? What's Wrong with the Bruins?